An ex James Calvert Spence College student has joined other young people calling on the government to change the way benefits payments are handled when young people are diagnosed with cancer. Becky Cole, who now lives in Longframlington, was 20 years old when she was diagnosed with Hodgkin’s Lymphoma at Christmas in 2014. The diagnosis left her not only with fears for her future, but also financial worries, as she had to give up her job and begin applying for sickness benefits. 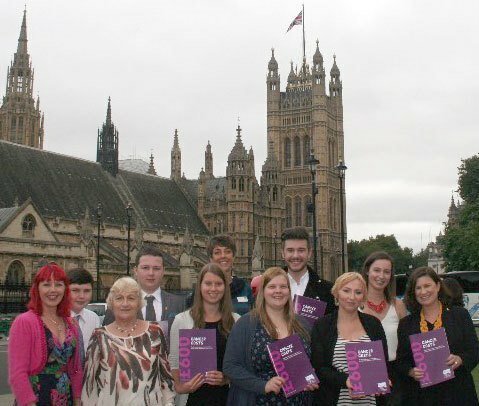 Becky was asked by cancer charity Clic Sargent, to take part in an event in the Houses of Parliament, to highlight the financial impact on young people diagnosed with cancer. The event was hosted by Labour MP Thangam Debbionare. “The main problem was the amount of money families or individuals are paying out each month to cover the cost of cancer. You need an extra £600 on top of all normal bills to fund the cost of this. It includes food, clothes, transport, bills when not able to work and hospital parking. “If it wasn’t for a Clic Sargent support worker in the Freeman Hospital, I don’t know what we would have done,” she said. The charity is calling for a number of changes to help ease the financial burden on children, young people and their families after a cancer diagnosis. They want a review of travel assistance for parents and young people, financial support from the point of diagnosis, and a review by financial services and energy companies to ensure parents of children with cancer and young cancer patients are included on their vulnerable customer policies. After her cancer diagnosis, Becky underwent six rounds of intense chemotherapy over six months and received the all clear in August 2015. She told The Ambler how pleased she had been to be able to take part in the parliamentary event : “My voice was heard not only for myself, but for many other young people suffering the same experience. I will also be contacting my local MP, Anne- Marie Trevelyan, to gain support and awareness for the cause. Becky said “It has been a once in a life time experience and I was thrilled to participate”.